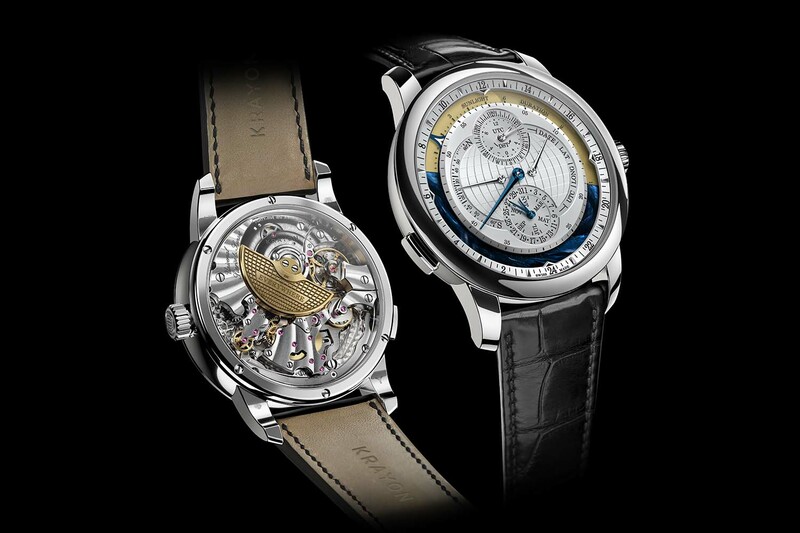 If some (rare) watches indicate the sunrise and sunset times, these are usually calibrated on a given place. 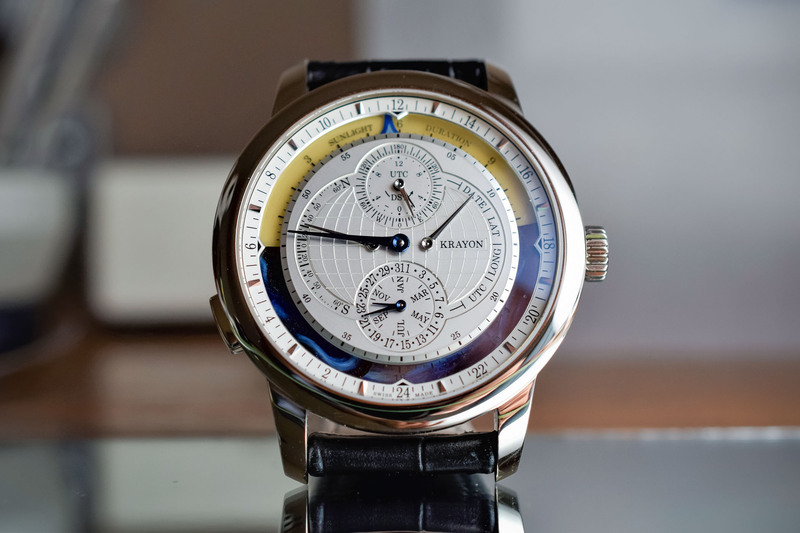 The Krayon Everywhere is the first mechanical watch to provide universal sunrise and sunset indications i.e. with the possibility to adjust the place. 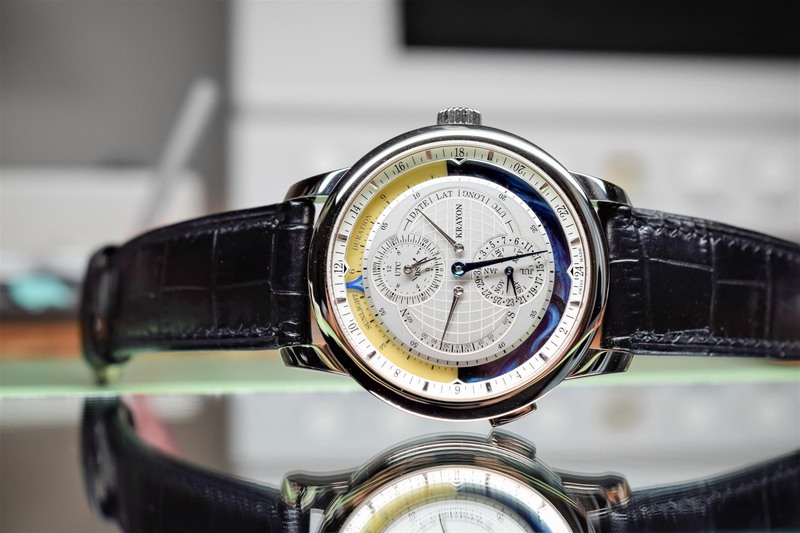 This world first is made possible by an uber-sophisticated movement which is able to compute the date (also taking into account the equation of time), the latitude, the longitude and the UTC. The Krayon USS calibre is made of no fewer than 595 components including 85 jewels, 4 differentials, 84 gear assemblies and 145 gear parts… without mentioning the highly-complex calculations needed to make all these parts perform the trick (For more information, read our introductory article here). 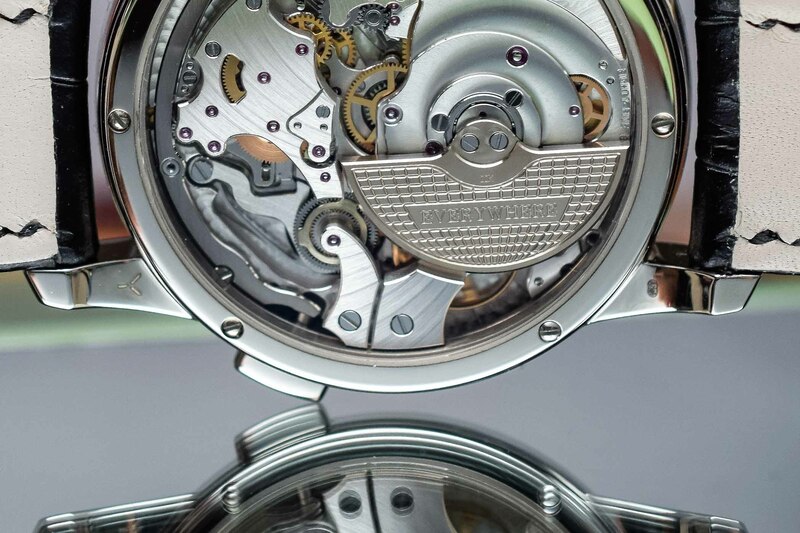 The superb 595-part micro-rotor movement of the Krayon Everywhere – Note: the barrel bridge above the micro-rotor has been photoshopped to erase an engraving made for a special order of the watch. The first thing to catch your eye is the rather restrained size of the watch. 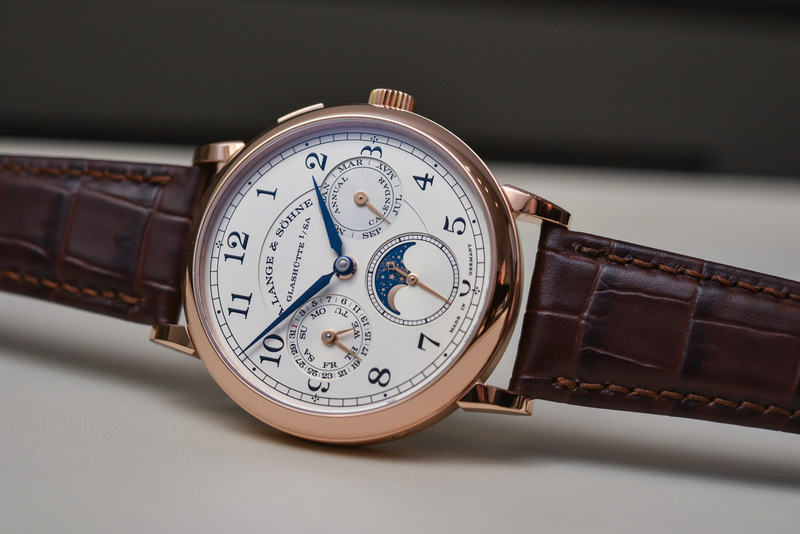 With such a complex movement, one would expect a massive, 45mm-plus case. The 18k white gold case of the Krayon Everywhere, in fact, shows a relatively restrained 42 mm diameter, thanks to the ultra-compact construction of the movement – which is just 35.40 mm by 6.50 mm, despite its 595 parts! 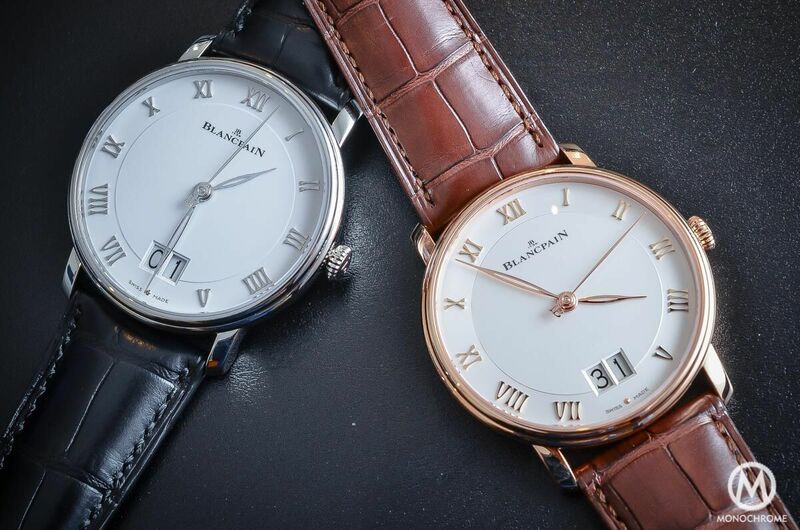 On the wrist, it wears perfectly well, thanks to its ergonomic lugs. The watch is superbly crafted. Thanks to its smart layout, the dial offers tons of visual depth, nice contrast and legibility, despite the numerous indications. The daily-used hands – date and time – are presented in blue to stand out. Contrasting with them, the hands corresponding to the settings have a softer colour. Hours are read from the blue index on the 24-hour scale that also shows how many hours have passed since the last sunrise. Minutes are shown by a large central hand. The duration of the night and day, as well as the sunrise and sunset times, can be read at a glance on the 24-hour ring thanks to three overlapping discs. Adjustments are quite simple to perform. The pusher on the left-hand-side allows selecting the parameter to adjust (date, latitude, longitude or UTC). Settings are then performed via the crown that has 3 positions: one for winding, one for setting the time and the third one for setting the parameter selected. These can be made by turning the crown forwards and backwards, thus protecting the mechanism against damage caused by mishandling. Flip the watch over and the view on the USS Caliber is indeed impressive. 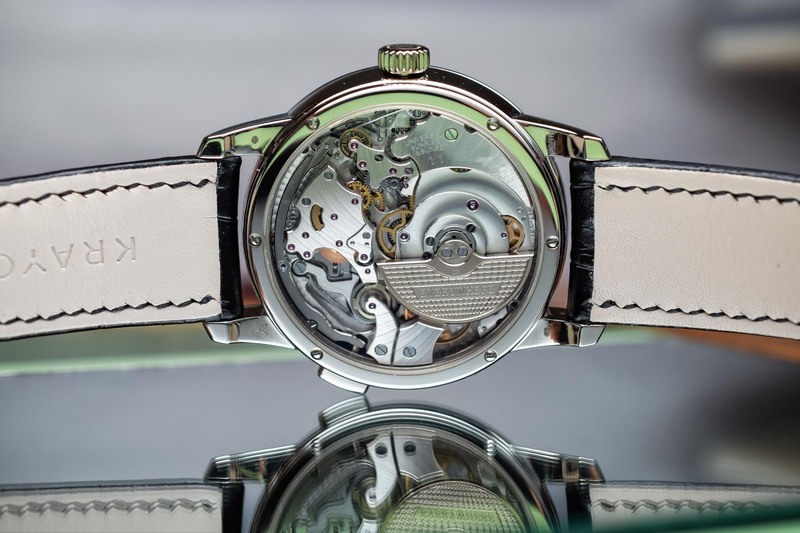 Beyond the complexity of the movement (in particular the differential and the mode selector), its finishing is top notch with hand-polished chamfers and a special pattern radiating from the centre of the movement on the bridges. 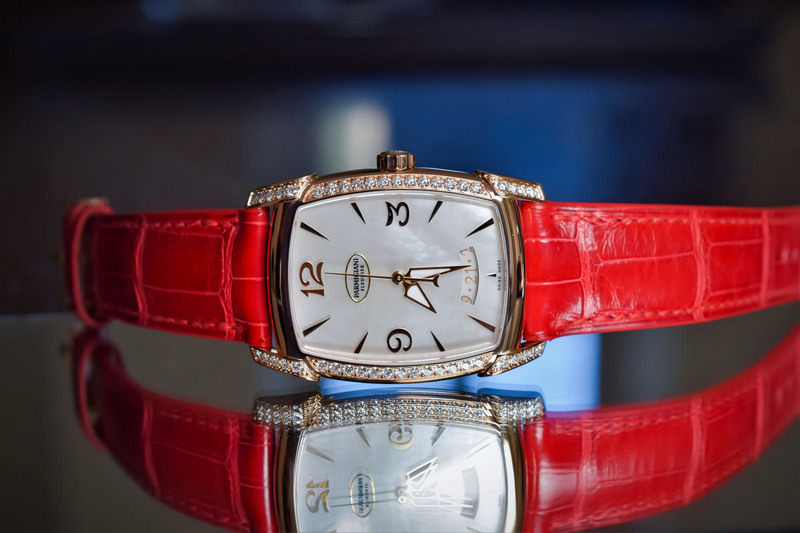 The 22k gold micro-rotor is nicely engraved and allows to store up to 72 hours of power reserve. The Krayon Everywhere is worn on a hand-stitched alligator strap secured with a pin buckle. For more information, please visit www.krayon.ch. 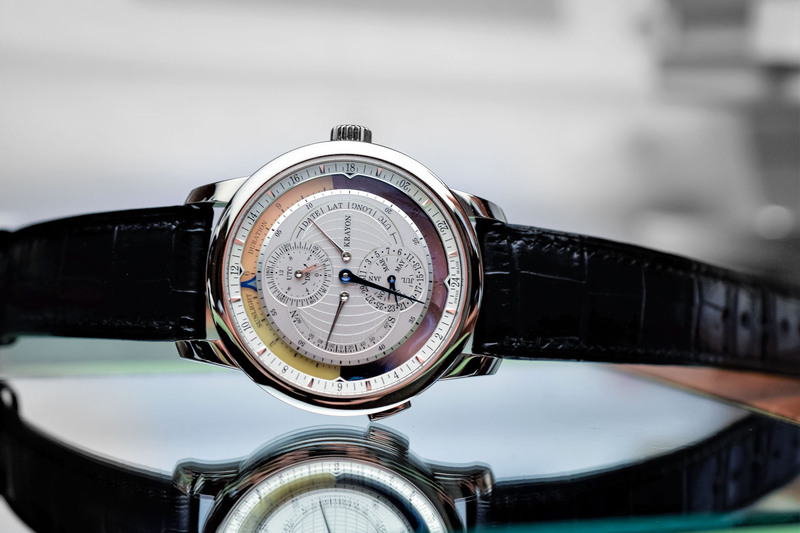 Editor’s note – the question of the price… As you can imagine, such a watch doesn’t come for cheap. Well, in the case of the Krayon Everywhere, we’re talking about 600k (Swiss Francs or US Dollars), which is, admittedly, a massive price tag. 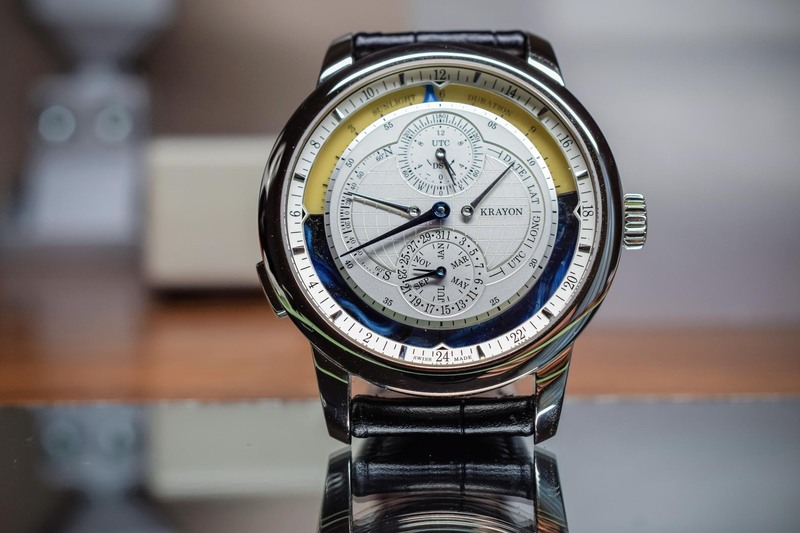 This sets this watch in a category where you find Greubel Forsey Tourbillons, Patek Minute Repeaters or some exotic, ultra-complex watches… So, in the case of the Krayon Everywhere, what can justify this price? The finishing and decoration, as nice as it is, it not on the same level as a Greubel. 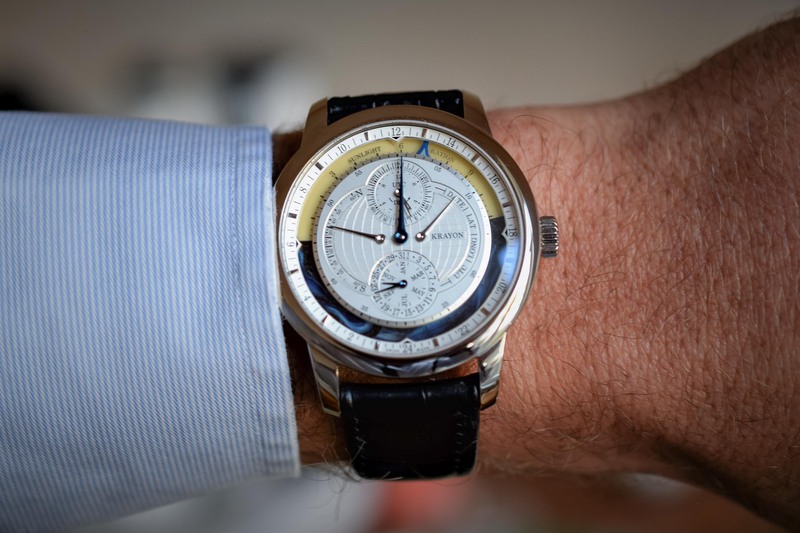 However, the development of a brand-new complication – and it is a really complicated movement – combined to the exclusivity of this watch (R&D costs cannot be absorbed as they could be at PP or VC) are a way to justify this price… Nothing is reasonable when it comes to ultra-high-end! Movement: USS calibre, mechanical with automatic winding (micro-rotor) – 35.40 mm x 6.50 mm – 72 h power reserve – 21’600 vibrations/h – 85 jewels – hours, minutes, date, month, universal sunrise and sunset time, daylight duration. 595 parts. Very cool watch. Does it handle polar latitudes during times when the sun never sets (or never rises)? 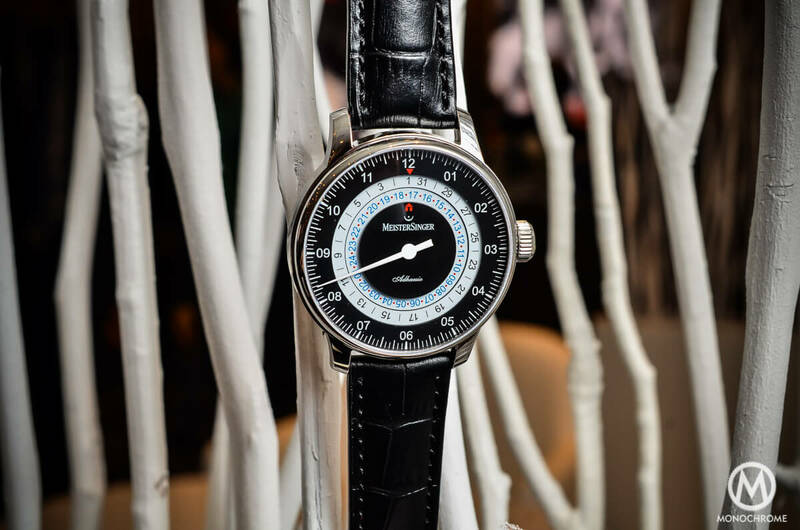 As shown on the dial, Latitude can be set up to 60° North and South, so the watch won’t allow to find midnight sun!